My name is Mike Lewis. 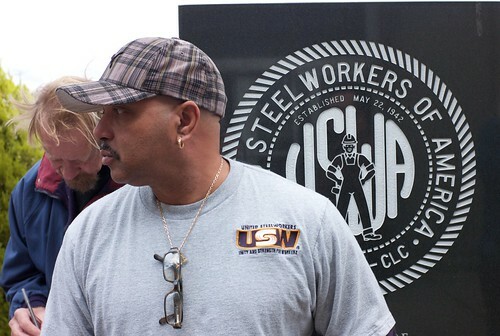 I am a 34-year steelworker from East Baltimore. I worked at Sparrows Point since I graduated from high school back in 1978 and I am currently one of our financial administrators here at the local union until the plant closed down I was a financial secretary here. so I’ve had working in first Beth Steel then ISG, Mittal, Oslo Mittal, Severstal and finally RG. It was a great opportunity for me to make a middle class living for myself and my family. But it was a great experience. You had to you know you had to learn the ropes. You saw how things worked. and being a product of the 70s, comin’ in the late seventies, a lot of the real challenging issues like Mr. Bartee talked about had pretty much been resolved. So you didn’t have a lot of the blatant types of discrimination that maybe people like my grandfather or great-uncle went through. And I viewed it as an opportunity for one day, if I worked hard, if I applied myself, there was opportunities for me to walk up that ladder. And eventually in some small way I did. I didn’t just stay in the labor department. I was able to become something at that plant that I know my grandfather would never have envisioned. The friends that you have in life, that you carry through your whole life, a lot of times we meet these people in our place of work especially a place like Sparrows Point where we had so many struggles yet we had so much unity. Thank God for unions in America because it made me realize that nothing was given freely, that everything was borne out of struggle. A lot of people they take for granted the fact that you get paid vacations. That was something that was borne out of the labor movement. That you get paid if you’re off sick. That you have worker’s compensation laws. That you have employer provided health insurance. That you have many safeguards in place, all that met with resistance when lobbied for, that we have in place today, that a lot of people think they are etched into the fabric, and today I see them being eroded. Not with a maul but with a chisel. They’re being chiseled away. A lot of the things that we fought for are being chiseled away and being taken away from us today. We’re not unique. This has been happening all over the country and we are slowly losing our middle class because we’re losing an entire segment of our economy. Part of the American dream has always been that if you work hard you can move up. Well, a plant like Beth Steel, a plant like a General Motors or a Ford plant, provide that opportunity for the average Joe growing up in America. I mean there is such a thing as a social conscience, you know, and a lot of people don’t have a problem looking at the symbols of this country, the stars and stripes, the great symbols of this country, and we should all pay homage to the greatness of this country. We should all pay homage to those symbols. But patriotism is more than just a symbolic gesture. Its time for people who call themselves patriots to start taking their checkbook and investing it in We The People. Start building a plant here. Stop taking the easy way out and outsourcing the jobs to China and Indonesia. Invest in the people of America.